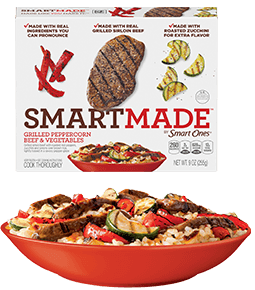 Smart Made (officially, SmartMade by Smart Ones) is the premium line of frozen meals by Smart Ones, which is owned by the Kraft Heinz Company, and loosely affiliated with Weight Watchers. 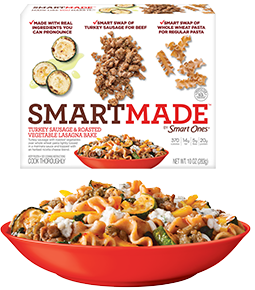 There are currently 19 different SmartMade meals. We've provided reviews and ingredients for all of them below. Each meal is rated for taste, nutrition, and how filling it is. The ratings are provided by iLoveThisDiet.com, the Supermarket Frozen Meal Diet Plan. 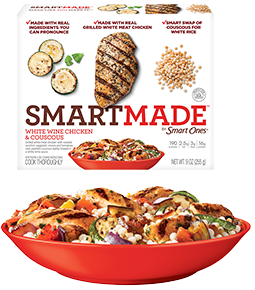 The chicken, turkey, beef, or pork featured in these meals is noticeably more appetizing, both in looks and flavor than what you’ll find in its cheaper cousin, Smart Ones. The same is true of the veggies in the meals. The pieces are bigger and more appealing to the eye and palette. 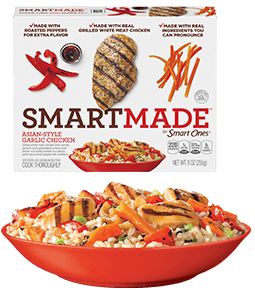 The quality and taste feels comparable to the premium "Simply" line from competitor Healthy Choice, of which I'm a big fan. 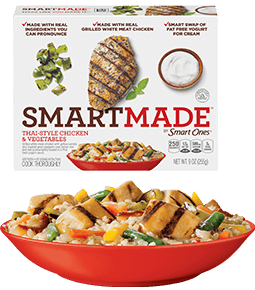 Though some people don’t care about the artificial preservatives and flavors in most frozen entrees (the FDA says they’re safe), many people in these health-conscious times, would rather not eat them. 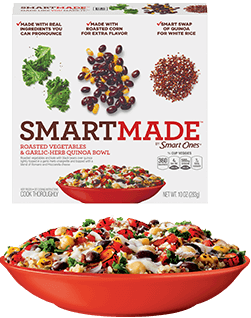 Quinoa is substituted for white rice. 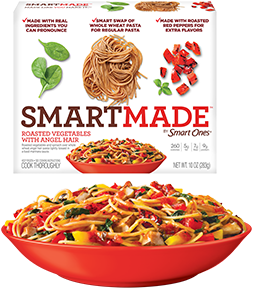 Whole wheat pasta replaces regular pasta. This means more fiber, which makes the meals not only better for your health, but more filling too. 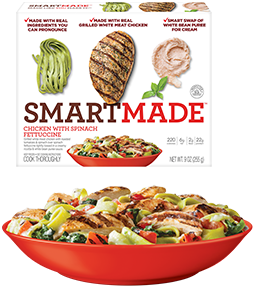 All meals are rated for taste, nutrition, and how filling most people will find them. Taste and fullness scores are 1-10, with 10 being best. Nutrition is a letter grade, with "A" being best. 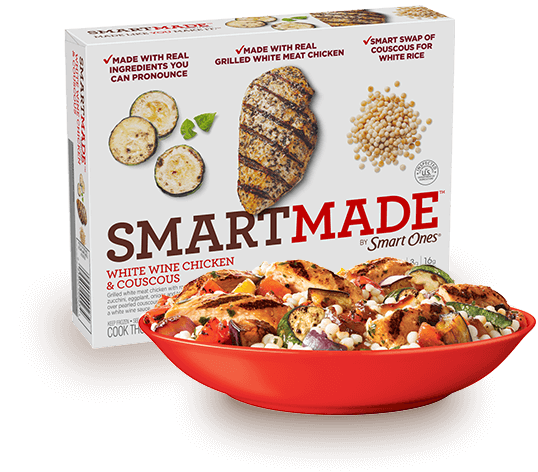 Ingredients: sauce (water, low fat ricotta cheese [whey, milk, cream, vinegar], parmesan cheese [cultured part-skim milk, salt, enzymes], bean puree, milk, cornstarch, garlic, butter [cream, salt], spices, cream, salt, lemon juice concentrate, natural flavor), chargrilled chicken breast fillet strips with rib meat (chicken breast fillet strips with rib meat, water, seasoning [sea salt, native food starch, spices, chicken stock, torula yeast, evaporated cane syrup, dried garlic and onion]), vegetable blend (fire roasted tomatoes, spinach), cooked spinach macaroni product (water, spinach macaroni product [semolina wheat flour, dried spinach]). 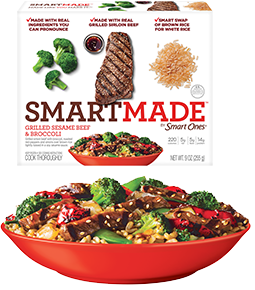 Ingredients: VEGETABLE BLEND (BROCCOLI, SUGAR SNAP PEAS, ONIONS, ROASTED RED BELL PEPPERS), SAUCE (WATER, PINEAPPLE JUICE CONCENTRATE, REDUCED SODIUM SOY SAUCE [WATER , WHEAT, SOYBEANS, SALT, ALCOHOL, VINEGAR, LACTIC ACID], DICED TOMATOES, TOMATO PUREE, CORNSTARCH, ONION JUICE CONCENTRATE, ROASTED SESAME OIL, SALT, ROASTED GRANULATED GARLIC, SESAME SEEDS, NATURAL FLAVOR, BEEF STOCK, SPICES, BEEF FAT, GARLIC POWDER), COOKED BROWN RICE (WATER, BROWN RICE), SEASONED COOKED GRILLED SIRLOIN BEEF STEAK STRIPS AND CORN STARCH PRODUCT (BEEF, BEEF BROTH, CORN STARCH, SALT, SUGAR , FLAVOR [YEAST EXTRACT, CITRUS EXTRACT], MALT EXTRACT, SUNFLOWER OIL, SPICE, SPICE EXTRACTIVES). 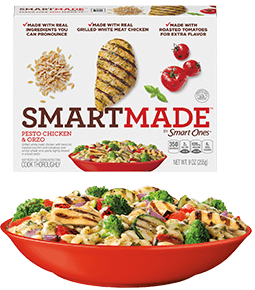 VEGETABLE BLEND (CHICKPEAS, KALE, ROASTED RED BELL PEPPERS, FIRE ROASTED RED ONIONS, ROASTED ARTICHOKES), SAUCE (WATER, SUN DRIED TOMATOES, ARTICHOKES, MILK, CREAM, CORNSTARCH, EXTRA VIRGIN OLIVE OIL, CHICKEN BROTH, LEMON JUICE CONCENTRATE, SALT, GRANULATED GARLIC, SPICES, NATURAL FLAVORS), COOKED QUINOA (WATER, QUINOA), FULLY COOKED CHARGRILLED CHICKEN BREAST FILLET STRIPS WITH RIB MEAT (CHICKEN BREAST FILLET STRIPS WITH RIB MEAT, WATER, SEASONING [SEA SALT, NATIVE FOOD STARCH, SPICES, CHICKEN STOCK, TORULA YEAST, EVAPORATED CANE SYRUP, DRIED GARLIC AND ONION]), FETA CHEESE (CULTURED MILK, SALT, ENZYMES). VEGETABLE BLEND (POBLANO CHILES, COOKED BLACK BEANS, ROASTED RED BELL PEPPERS, ROASTED ONIONS, CORN, FIRE ROASTED POBLANO PEPPERS), CHARGRILLED CHICKEN BREAST FILLET STRIPS WITH RIB MEAT (CHICKEN BREAST FILLET STRIPS WITH RIB MEAT, WATER, SEASONING [SEA SALT, NATIVE FOOD STARCH, SPICES, CHICKEN STOCK, TORULA YEAST, EVAPORATED CANE SYRUP, DRIED GARLIC AND ONION]), SAUCE (WATER, TOMATILLOS, GREEN CHILES, ONIONS, CORNSTARCH, JALAPENO PEPPERS, CHICKEN MEAT [INCLUDING CHICKEN JUICES], HONEY, SALT, CILANTRO, LIME JUICE CONCENTRATE, DEHYDRATED ONION, GRANULATED GARLIC, FLAVORINGS [ONION POWDER, SOL POULTRY FLAVOR AND ROSEMARY], SPICE, NATURAL FLAVORS, CARROT POWDER, TURMERIC), COOKED BROWN RICE (WATER, BROWN RICE), MONTEREY JACK CHEESE (CULTURED MILK, SALT, ENZYMES). 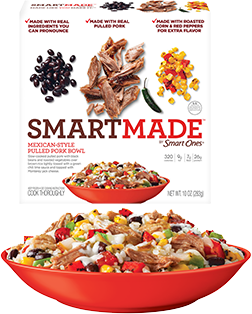 VEGETABLE BLEND (COOKED BLACK BEANS, CORN, GREEN BELL PEPPERS, ROASTED ONIONS, ROASTED RED BELL PEPPERS, FIRE ROASTED TOMATOES), COOKED SEASONED PORK (PORK, WATER, ORANGE JUICE CONCENTRATE, SALT, GARLIC POWDER, ONION POWDER), SAUCE (WATER, TOMATILLOS, FIRE ROASTED POBLANO PEPPERS, GREEN CHILES, ONIONS, CORNSTARCH, JALAPENO PEPPERS, CHICKEN MEAT [INCLUDING CHICKEN JUICES], HONEY, SALT, CILANTRO, LIME JUICE CONCENTRATE, DEHYDRATED ONION, GRANULATED GARLIC, FLAVORINGS [ONION POWDER, SOL POULTRY FLAVOR AND ROSEMARY], SPICE, NATURAL FLAVORS, CARROT POWDER, TURMER­IC), COOKED BROWN RICE (WATER, BROWN RICE), MONTEREY JACK CHEESE (CULTURED MILK, SALT, ENZYMES). 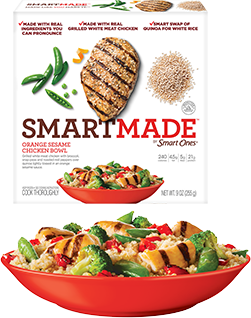 VEGETABLE BLEND (BROCCOLI, SUGAR SNAP PEAS, ROASTED RED BELL PEPPERS), FULLY COOKED GRILLED WHITE CHICKEN MEAT CHUNKS (WHITE MEAT CHICKEN, WATER, CONTAINS 2% OR LESS OF THE FOLLOWING: SALT, NATIVE FOOD STARCH [TAPIOCA AND RICE], OAT FIBER, CHICKEN STOCK, ROSEMARY EXTRACTIVES, SUGAR, CORN OIL), COOKED QUINOA (WATER, QUINOA), SAUCE (WATER, ORANGE JUICE CONCENTRATE, REDUCED SODIUM SOY SAUCE [WATER, WHEAT, SOYBEANS, SALT, ALCOHOL, VINEGAR, LACTIC ACID], HONEY, CORNSTARCH, PINEAPPLE JUICE CONCENTRATE, NAVEL ORANGE PEEL, ROASTED SESAME OIL, ROASTED GARLIC PUREE, SESAME SEEDS, ONION JUICE CONCENTRATE, SALT). 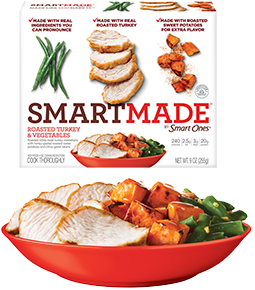 ROASTED SWEET POTATOES IN SAUCE (ROASTED SWEET POTATOES, WATER, DARK BROWN SUGAR, HONEY, BUTTER [CREAM (MILK), SALT], CORNSTARCH, SALT, SPICES, NATURAL FLAVOR), CITRUS GREEN BEANS (GREEN BEANS, WATER, NAVEL ORANGE PEEL, CORN STARCH, SALT), OVEN ROASTED TURKEY BREAST MEDALLIONS (TURKEY BREAST MEAT, WATER, CONTAINS 2% OR LESS: TAPIOCA STARCH, SALT, SEASONING [YEAST EXTRACT, CITRUS EXTRACT], CANOLA OIL, NATURAL FLAVOR, SEASONING [TURKEY BROTH, SALT, NATURAL FLAVORING, SPICE EXTRACTIVE, EXPELLER PRESSED SUNFLOWER OIL], PAPRIKA). 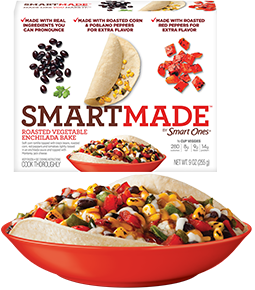 VEGETABLE BLEND (FIRE ROASTED TOMATOES, COOKED BLACK BEANS, CORN, ROASTED RED BELL PEPPERS, POBLANO CHILES), SAUCE (WATER, TOMATO PASTE, DISTILLED WHITE VINEGAR, SPICES, HONEY, SALT, CORNSTARCH, DEHYDRATED ONION, WHITE CORN FLOUR, GRANULATED GARLIC, PAPRIKA, GARLIC POWDER), RICOTTA FILLING (LOW FAT RICOTTA CHEESE [WHEY, MILK, CREAM, VINEGAR], BEAN PUREE, MILK, PARMESAN CHEESE [CULTURED PART-SKIM MILK, SALT, ENZYMES], CILANTRO, SALT, CREAM, SPICES), CORN TORTILLA (WHITE CORN MASA FLOUR [WHITE CORN MASA, CORN GERM], WATER, CULTURED CORN SUGAR, CELLULOSE GUM, CITRIC ACID), CHEESE BLEND (CHEDDAR CHEESE [MILK, CHEESE CULTURE, SALT, ENZYMES, ANNATTO (COLOR)], LOW MOISTURE PART-SKIM MOZZARELLA CHEESE [MILK, NONFAT MILK, CHEESE CULTURES, SALT, ENZYMES], MONTEREY JACK CHEESE [CULTURED MILK, SALT, ENZYMES]). 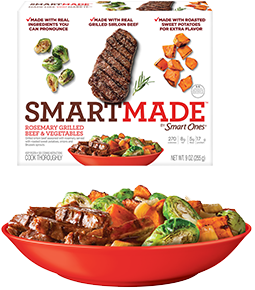 SEASONED VEGETABLE BLEND (ROASTED SWEET POTATOES, ONIONS, ROASTED BRUSSEL SPROUTS, EXTRA VIRGIN OLIVE OIL, ROASTED GRANULATED GARLIC, SALT), SEASONED COOKED GRILLED SIRLOIN BEEF STEAK STRIPS AND CORN STARCH PRODUCT (BEEF, BEEF BROTH, CORN STARCH, SALT, SUGAR, FLAVOR [YEAST EXTRACT, CITRUS EXTRACT], MALT EXTRACT, SUNFLOWER OIL, SPICE, SPICE EXTRACTIVES), SAUCE (WATER, BURGUNDY WINE, TOMATO PASTE, CORNSTARCH, RED WINE VINEGAR, BEEF STOCK, ONION JUICE CONCENTRATE, ROASTED RED BELL PEPPER PUREE, NATURAL FLAVOR, MOLASSES, SPICES, ROASTED GRANULATED GARLIC, SALT, GARLIC, BEEF FAT, GARLIC POWDER). 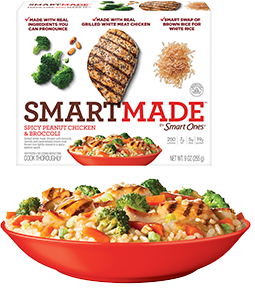 VEGETABLE BLEND (CARROTS, BROCCOLI, ONIONS), SAUCE (WATER, DARK BROWN SUGAR, PEANUT BUTTER, REDUCED SODIUM SOY SAUCE [WATER, WHEAT, SOYBEANS, SALT, ALCOHOL, VINEGAR, LACTIC ACID], CORNSTARCH, SALT, SESAME SEEDS, ROASTED GRANULATED GARLIC, ONION JUICE CONCENTRATE, SPICES), FULLY COOKED GRILLED WHITE CHICKEN MEAT CHUNKS (WHITE MEAT CHICKEN, WATER, CONTAINS 2% OR LESS OF THE FOLLOWING: SALT, NATIVE FOOD STARCH [TAPIOCA AND RICE], OAT FIBER, CHICKEN STOCK, ROSEMARY EXTRACTIVES, SUGAR, CORN OIL), COOKED BROWN RICE (WATER, BROWN RICE), ROASTED PEANUTS. VEGETABLE BLEND (FIRE ROASTED GREEN BELL PEPPERS, CARROTS, GREEN BEANS, ONIONS), BROWN RICE AND QUINOA BLEND (WATER, BROWN RICE, RED QUINOA), FULLY COOKED GRILLED CHICKEN BREAST WITH RIB MEAT CHUNKS (BONELESS SKINLESS CHICKEN BREAST WITH RIB MEAT, WATER, CONTAINS 2% OR LESS OF THE FOLLOWING: SALT, NATIVE FOOD STARCH [TAPIOCA AND RICE], OAT FIBER, CHICKEN STOCK, ROSEMARY EXTRACTIVES, SUGAR, CORN OIL, SAUCE (WATER, MILK, BEAN PUREE, ONIONS, CORNSTARCH, NONFAT YOGURT [CULTURED PASTEURIZED GRADE A NONFAT MILK], CREAM, CHICKEN MEAT INCLUDING CHICKEN JUICES], GARLIC, HONEY, DEHYDRATED COCONUT MILK, SALT, GREEN CHILI PEPPERS, GINGER, CHILI POWDER, SUGAR, SODIUM CASEINATE, THAI BASIL, POTATO FLOUR, FLAVORINGS [ONION POWDER, SOL POULTRY FLAVOR AND ROSEMARY], LEMON JUICE CONCENTRATE, NATURAL FLAVOR, SPINACH POWDER, SPICES, CANOLA OIL, EVAPORATED CANE JUICE, CARROT POWDER, TURMERIC). SAUCE (WATER, DICED TOMATOES, TOMATO PUREE, ROASTED RED BELL PEPPER PUREE, BALSAMIC VINEGAR, CORNSTARCH, ROASTED GARLIC, EXTRA VIRGIN OLIVE OIL, GARLIC, SPICES, PARSLEY, ROASTED GRANULATED GARLIC, NATURAL FLAVOR, SALT), COOKED WHOLE WHEAT MACARONI PRODUCT (WHOLE WHEAT MACARONI PRODUCT, WATER), RICOTTA FILLING (LOW FAT RICOTTA CHEESE [WHEY, MILK, CREAM, VINEGAR], MILK, PARMESAN CHEESE [CULTURED PART-SKIM MILK, SALT, ENZYMES], CREAM, PARSLEY, SALT, SPICE), FULLY COOKED TURKEY SAUSAGE (TURKEY, SPICES, ONIONS, SEA SALT, GARLIC, NATURAL FLAVORS), VEGETABLE BLEND (FIRE ROASTED ZUCCHINI, CARROTS, SPINACH), LOW MOISTURE PART-SKIM MOZZARELLA CHEESE (MILK, NONFAT MILK, CHEESE CULTURES, SALT, ENZYMES). VEGETABLE BLEND (FIRE ROASTED TOMATOES, FIRE ROASTED ZUCCHINI, FIRE ROASTED RED ONIONS, ROASTED EGGPLANT), CHARGRILLED CHICKEN BREAST FILLET STRIPS WITH RIB MEAT (CHICKEN BREAST FILLET STRIPS WITH RIB MEAT, WATER, SEASONING [SEA SALT, NATIVE FOOD STARCH, SPICES, CHICKEN STOCK, TORULA YEAST, EVAPORATED CANE SYRUP, DRIED GARLIC AND ONION]), COOKED COUSCOUS (WATER, COUSCOUS [WHEAT FLOUR]), SAUCE (WATER, CHABLIS WINE, PARSLEY, CORNSTARCH, MILK, GARLIC, SPICES, CHICKEN BROTH, SALT, LEMON JUICE CONCENTRATE, GREEN ONIONS, CREAM, HONEY, GRANULATED ONION, NATURAL FLAVOR, VINEGAR). 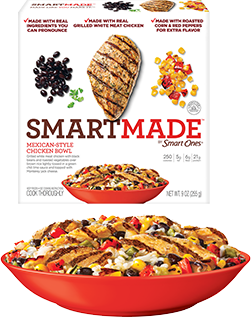 FULLY COOKED GRILLED WHITE CHICKEN MEAT CHUNKS (WHITE MEAT CHICKEN, WATER, CONTAINS 2% OR LESS OF THE FOLLOWING: SALT, NATIVE FOOD STARCH [TAPIOCA AND RICE], OAT FIBER, CHICKEN STOCK, ROSEMARY EXTRACTIVES, SUGAR, CORN OIL), SAUCE (WATER, REDUCED SODIUM SOY SAUCE [WATER, WHEAT, SOYBEANS, SALT, ALCOHOL, VINEGAR, LACTIC ACID], GARLIC, CORNSTARCH, HONEY, GRANULATED GARLIC, DRIED SHIITAKE MUSHROOMS, ROASTED SESAME SEED OIL, SESAME SEEDS, SALT, CANOLA OIL, GINGER PUREE), VEGETABLE BLEND (ONIONS, CARROTS, ROASTED RED BELL PEPPERS, SPINACH), COOKED BROWN RICE (WATER, BROWN RICE), GREEN ONIONS. VEGETABLE BLEND (FIRE ROASTED ZUCCHINI, FIRE ROASTED RED ONIONS, BROCCOLI, FIRE ROASTED TOMATOES), FULLY COOKED GRILLED WHITE CHICKEN MEAT CHUNKS (WHITE MEAT CHICKEN, WATER, CONTAINS 2% OR LESS OF THE FOLLOWING: SALT, NATIVE FOOD STARCH [TAPIOCA AND RICE], OAT FIBER, CHICKEN STOCK, ROSEMARY EXTRACTIVES, SUGAR, CORN OIL), COOKED ORZO (WHOLE WHEAT PASTA [WHOLE DURUM WHEAT FLOUR], WATER), SAUCE (WATER, PARMESAN CHEESE [CULTURED PART-SKIM MILK, SALT, ENZYMES], EXTRA VIRGIN OLIVE OIL, BASIL, CORNSTARCH, SALT, GARLIC, NATURAL FLAVOR, SPICES). 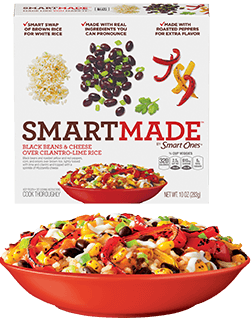 VEGETABLE BLEND (CHICKPEAS, KALE, COOKED BLACK BEANS, FIRE ROASTED TOMATOES, ROASTED RED BELL PEPPERS, CORN, FIRE ROASTED RED ONIONS), SAUCE (WATER, GARLIC, PARMESAN CHEESE [CULTURED PART-SKIM MILK, SALT, ENZVMES], SPICES, EXTRA VIRGIN OLIVE OIL, HONEY, MILK, CORNSTARCH, SALT, GRANULATED ONION, ROASTED GRANULATED GARLIC, CREAM, LEMON JUICE CONCENTRATE, CELERY, TOMATOES, ONIONS, CARROT JUICE CONCENTRATE, CARROTS, NATURAL FLAVOR, LEEKS, TOMATO PASTE, PARSLEY), COOKED QUINOA (WATER, QUINOA), LOW MOISTURE PART-SKIM MOZZARELLA CHEESE (MILK, NON-FAT MILK, CULTURES, SALT, ENZYMES), ROMANO CHEESE MADE FROM COW'S MILK (CULTURED PART SKIMMED COW'S MILK, SALT, ENZYMES). VEGETABLE BLEND (FIRE ROASTED ZUCCHINI, ONIONS, ROASTED RED BELL PEPPERS), COOKED BROWN RICE (WATER, BROWN RICE), SEASONED COOKED GRILLED SIRLOIN BEEF STEAK STRIPS AND CORNSTARCH PRODUCT (SIRLOIN BEEF, BEEF BROTH, CORN STARCH, SALT, SUGAR, SEASONING [YEAST EXTRACT, CITRUS EXTRACT], MALT EXTRACT, SUNFLOWER OIL, SPICE, SPICE EXTRACTIVES), SAUCE (WATER, HONEY, ROASTED RED BELL PEPPER PUREE, APPLE CIDER VINEGAR, CORNSTARCH, SALT, NATURAL FLAVOR, BLACK PEPPER, CAYENNE PEPPER PUREE, ACETIC ACID). VEGETABLE BLEND (CORN, COOKED BLACK BEANS, ROASTED RED BELL PEPPERS, YELLOW BELL PEPPERS, ONIONS), SAUCE (WATER, TOMATO PASTE, BEAN PUREE, CILANTRO, CORNSTARCH, SALT, LIME JUICE CONCENTRATE, PAPRIKA, ROASTED GRANULATED GARLIC, ONION POWDER, SPICES), COOKED BROWN RICE (WATER, BROWN RICE), LOW MOISTURE PART-SKIM MOZZARELLA CHEESE (MILK, NON-FAT MILK, CULTURES, SALT, ENZYMES), GREEN ONIONS.